Will a stock safety cover’s straps match my existing cover’s anchor point pattern? 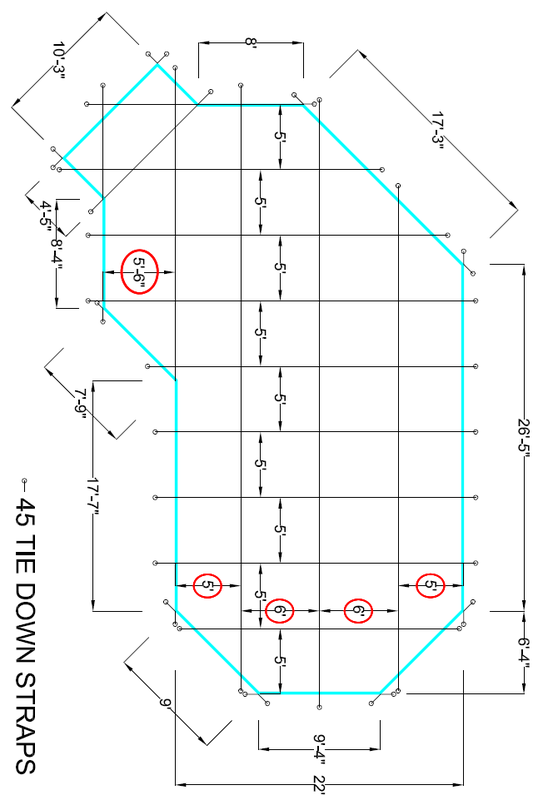 Would your stock safety covers match this existing cover anchor pattern? The short answer would be: No. The long answer goes something like this: different manufacturers use different anchoring distances and even the same manufacturer can change those from year to year. Basically, guessing that a standard cover will match your existing cover is a crapshoot. And like most crapshoots, it will end with you having less money and a frown on your face. If you are dead set on getting your anchor points matched, the only way to do it correctly (and the only way our manufacturer will guarantee it) is if you take your existing cover and ship it to their factory for a template replication. If you want to know the full scoop on matching anchor points, read our article titled: How Can I Match My Safety Cover’s Strap Placement? Contact us to arrange a template replication with the manufacturer. The manufacturer will provide their shipping address and Return Merchandise Authorization (RMA) which is similar to an order number. Ship the cover to the address provided and tag it with the RMA number for identification. All springs, buckles and any other hardware need to be removed before the cover is shipped. The manufacturer charges a fee if they have to remove the hardware themselves. Three to five days after the cover is received an official quote will be provided. Most people fret because they say, “How much is it going to cost me for shipping?” Normally I would say $50 to $100, but think about it like this: $50 or $100 to ship a cover so you don’t have to spend $250 to $500 on extra work to install a brand new cover. If you have any questions on your above ground pool then we would be happy to help. Feel free to give us a call at 1-877-372-6038 or email us at upload@inyopools.com. If you liked this article, then make sure to sign up for our blog and get our Free 128 Page Pool Care Guide.